Don't put it off — take it off! Then keep it off! Don't risk another dieting dead-end. Set yourself on the road to success with a weight-loss program you can stick with — and enjoy! Have diets failed you in the past? Put an end to dieting disappointment for good with a report from the health and nutrition professionals at Harvard Medical School. Why do most diets not deliver as advertised? In a word: boredom. We start well, but after too many meals that are too restrictive, we lose interest. We're justifiably bored. And we quit. So, how do you find a weight-loss program you can stay with to the end — and beyond? How do you lose weight and keep it off? Lose Weight and Keep It Off reveals the two keys to successful weight loss. The first is finding a diet and exercise program that suits you, your lifestyle, your likes, and your goals. The second is "skill power," a powerful set of specific habits that can make all the difference between setbacks and lasting success. In this revealing report, you will learn how various popular diets — from Paleo to gluten free, plant-based to detox and cleanses — stack up for long-term results. You'll read how Jenny Craig and Weight Watchers compare. You will discover the wisest choice for "good carbs" and the one diet the American Heart Association warns against, and, as a bonus, you'll get a week of daily menus with delicious entrees even non-dieters will love. In a special section, Harvard's experts share the 10 skill power techniques that will reinforce and reward your progress. From setting the right goals to finding a support network, these habits will move you to your weight-loss goals with greater confidence and certainty. If you want to lose weight, you can make it happen! 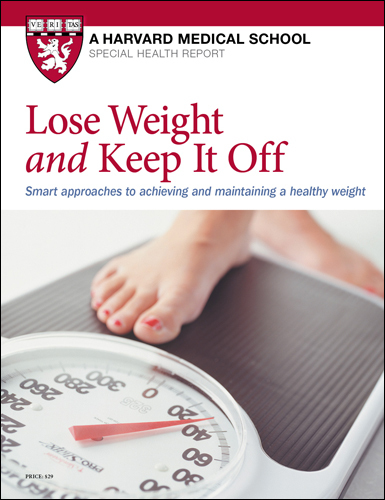 Order your copy of Lose Weight and Keep It Off now! PRICE ... shipping and handling is free! Harvard Medical School was again ranked as the country’s #1 Medical School for Research by US News & World Report.